Olohana and our partners, as members of Native communities in Hawaii, the Pacific Islands, Alaska, and the U.S. mainland, feel the legacy of colonialism in our bones. Today, following centuries of oppression, Native communities face high levels of poverty, food insecurity, and poor health. Our goal is to work within our Native and underserved communities to develop and support rural development projects that build community capacity, increase food, energy, and water security, create economic opportunities, and restore the practice of traditional food systems and farming methods. For the past several years, the U.S. Department of Agriculture (USDA) and the U.S. Office of International Affairs (OIA) have contracted with M. Kalani Souza, Olohana founding director, and Olohana partner, Agroforestry Net’s Craig Elevitch, as instructors to teach breadfruit agroforestry. They have traveled throughout Polynesia, Micronesia, U.S. affiliate islands and the U.S. Virgin Islands as instructors. Working with 100 communities in Hawaii, the U.S. mainland, U.S.-affiliated islands, and internationally, in commemoration of the 100-year anniversary of Victory Gardens, we will plant 10,000 food forests and conduct a national indigenous phenology study. It is a proposal to the MacArthur Foundation for their 2016 100&Change challenge. In 2015 Olohana initialized two food forest installations: a demonstration site in Waimea for Kanu O Ka ‘Aina Learning Ohana Charter School and a breadfruit heritage food forest for International Union for Conservation of Nature (IUCN) 2016 conference Hawaii in Kaiholena in partnership with Hawaii National Park Service Ala Kahakai Trail Association. Olohana partners with Micronesian Executive Leadership Initiative, University of Hawaii at Manoa Shidler College of Business, Agroforestry Net, and Intertribal Council on Utility Policy to create local food and renewable energy micro-hubs for community self-sufficiency and economic development and opportunity. Olohana works with ten farms on the Big Island to establish food forest farms, from ¼ acre homesteads to large commercial farms, some are well established as organic, polycultured farms and others Olohana assists in transitioning from coffee and mac nut monocrops to breadfruit agroforests. 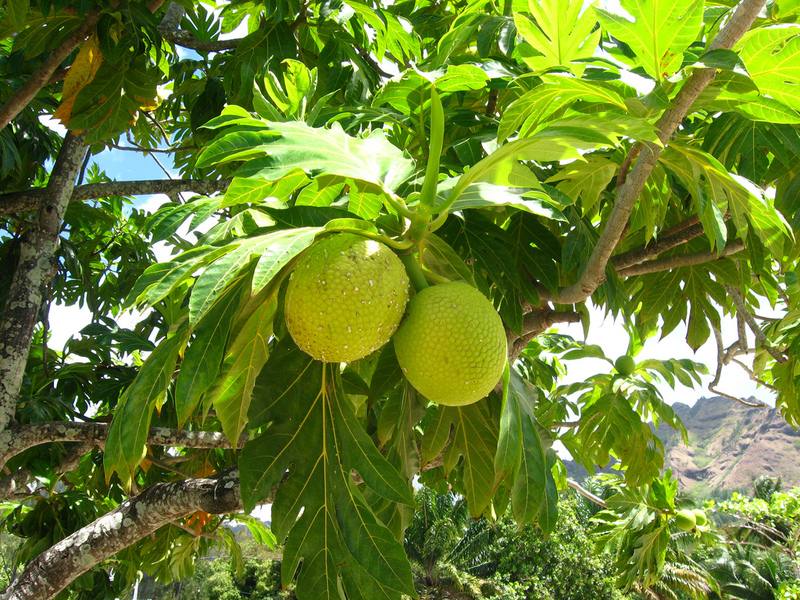 The Breadfruit/Ulu Initiative is a multi-pronged project. 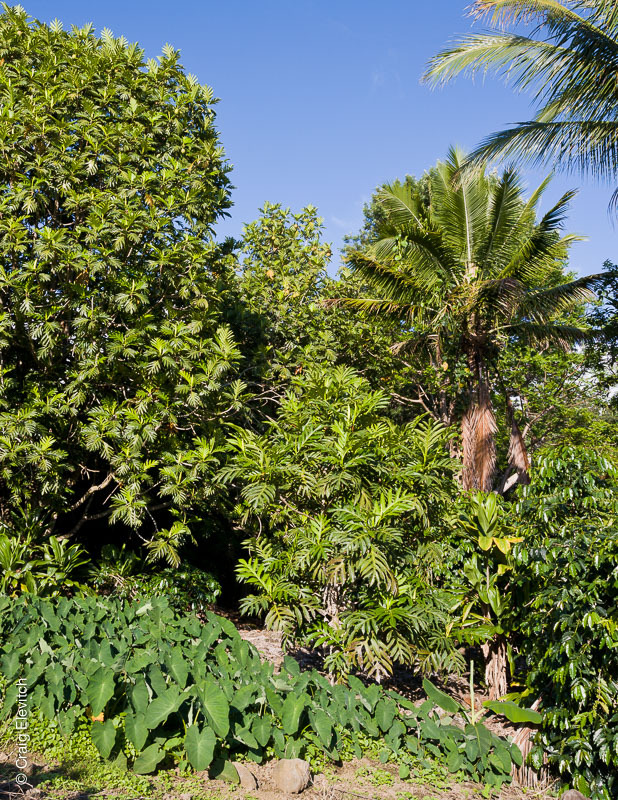 While food production using traditional growing practices of the Pacific Islands and tropics is the project’s first objective, energy production is part of the equation. Using plant byproducts and new technology, the Breadfruit/Ulu Initiative will produce micro-energy hubs for local consumption and area distribution. Olohana partners with the Shidler College of Business at the University of Hawaii, Intertribal Council on Utility Policy, Agroforestry Net, and others in the development of this initiative. 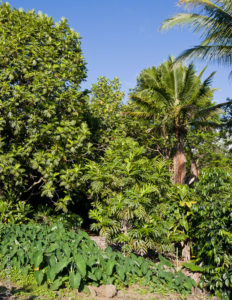 Among its other objectives to promote food and energy security for Native populations and under-served communities in Hawaii, the Pacific and Caribbean Islands, and other tropical nations, the Breadfruit/Ulu Initiative includes opportunities for the economic advancement of participating communities. Olohana and partners are working to develop the global marketplace for distribution and sales of breadfruit/ulu and its products. Olohana partners with the Shidler College of Business at the University of Hawaii, Intertribal Council on Utility Policy, Agroforestry Net, and others in the development of this initiative.